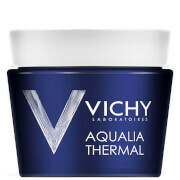 VICHY AQUALIA THERMAL NIGHT SPA Replenishing anti-fatigue cream-gel 75ml, is a replenishing night cream and anti-fatigue sleeping mask. Created for those with dehydrated skin, sensitive skin, that lacks radiance and plumpness. The NIGHT SPA works to infuse the complexion with intense moisture overnight when the skin is most receptive to treatments. The innovative formula is enriched with the VICHY Thermal Spa Water, patented Aquabioryl, hydrating complex and a high concentration of Hyaluronic Acid. Active Ingredients: VICHY Thermal Spa Water, Aquabioryl, Hyaluronic Acid. 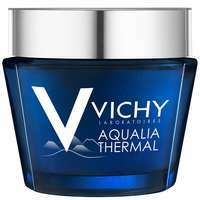 VICHY AQUALIA THERMAL NIGHT SPA Replenishing anti-fatigue cream-gel 75ml was found on 5 websites and was price compared using EAN: 3337871324568. The cheapest VICHY AQUALIA THERMAL NIGHT SPA Replenishing anti-fatigue cream-gel 75ml is shown as the main item, prices range from £16.30 to £24.50, excluding delivery. Price comparison based on price and delivery charges, with any valid discount codes being applied, is shown in the table above. Prices and information correct at the time of publication.